Last year, I planned a trip with absolute duality. It took me from the sensory overload of Tokyo to a tranquil and remote rainforest in Borneo. What can I say about Tokyo other than it is like no other city you will every visit. Connectivity and the Nature of Things. Installation at The Hara Museum of Contemporary Art, Tokyo. The other show I caught was Araki Nobuyoshi | Sentimental Journey 1971-2017 at Top Museum which was incredibly beautiful and moving. Electric Avenue. The pleasantly overstimulating Shinjuku District at night. Crosswalk Congestion. Any time during the day, the crush of shoppers in front of Shibuya Modi. Won't you be my neighbor? (above L to R) â�¤ï¸�1. A slice of architecture that forced me to stop and stare. 2. Exit Shinjuku. Enter next neighborhood. A view from my walk to vintage shops galore. 2. Assorted Japanese snacks for fuel, fast food, Rhubarb Series 5 Sherbet from Comme des Garcons. Shopping in Shimokitazawa. (above L to R) 1. I sought out this neighborhood specifically because I had heard of the unusually high concentration of vintage and secondhand shops. The streets are very narrow which limits car traffic, making the roads pedestrian friendly. I love this feature because it makes the neighborhood more intimate and charming. The best way to get to know a city is to throw yourself into the neighborhoods and just walk. It feels very inspiring and powerful to enter a district where you know the people around you not only understand but share your â�¤ï¸� for vintage. 2. Inside New York Joe Exchange where the crew was so sweet and warm. I purchased a thin threadbare blue vintage Nike tee with the Swoosh. One of my new favorite tees. 3. Sacks of loot inside NYJE on the upper floor. 4. Shopgirl burning up social media on her phone and guarding the loot at NYJE. More digging for buried treasures and people watching in Shimokitazawa. (above L to R) 1. Entryway to Haight & Ashbury (same owners of the shops: Boy and Fake Tokyo). 2. Checking out the curated stock inside Flamingo, which has multiple locations in Tokyo. 3. Storefront of Juxtaposition. Another one of many small vintage shops in my favorite but often overlooked neighborhood. Humanity. (above L to R) 1. Beautiful pristine ox-blood vintage wheels in JingÅ«mae. 2. A lovely, small handwritten card at WRITE&DRAW in Shibuya, where I impulse purchased little gifts :) I â�¤ï¸� the proudly -Made in Japan- reminder. 3. What was that? Oh, just a missile from North Korea that shot over Japan while I was visiting. 4. Personal touches on a once white Mazda. All by humans. Dan Flavin | Espace Louis Vuitton. (L to R) After days of feeling like a canned sardine in the streets and on subway cars, I recharged here. The hidden treasure of Tokyo waits on the 7th floor of the LV flagship. I took the elevator up and there were two guards standing in a vast space the size of a basketball court that offered 6 installations -all free to see BTW. It is the opposite of a cave; A space flooded with light that offers the most stunning views of the city. I only wished that more people knew of this space. Sharp contrast. (above L to R) 1. Farewell. An overview of Tokyo, the capital of Japan. 2. From overpopulated cityscape to remote, lush rainforest. Touchdown in Sarawak, Borneo. 3. Opening of a cave at Gunung Mulu National Park. Connectivity and the Natural Thing. 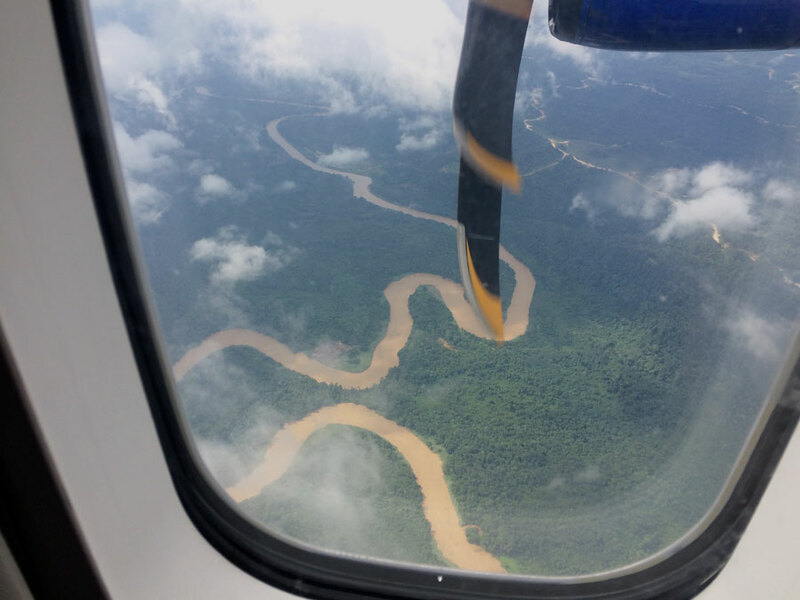 View of the terrain below on the flight from Miri to Sarawak, Borneo. "Unplug at Mulu Marriott. Mulu Marriott is nestled in a remote tropical Rainforest, on the outskirts of the UNESCO Gunung Mulu National Park... Connectivity is not available in your guest room so relax, unplug, & unwind."